Savina Yannatou studied singing with Gogo Georgilopoulou and Spiros Sakkas in Athens, and later attended postgraduate studies at the Guildhall School of Music and Drama in London with a scholarship awarded by Mousigetis Foundation. In 1979 she began working as a professional, in the greek radio 3, participating in the daily program ?Lilipoupolis? in collaboration with the composer Lena Platonos. Following that, her career took off collaborating with many greek composers (Platonos, Mamangakis, Kypourgos, Katsoulis, Gregoriou, Marangopoulos, Kamarotos, a.o.) and having released numerous albums since then. 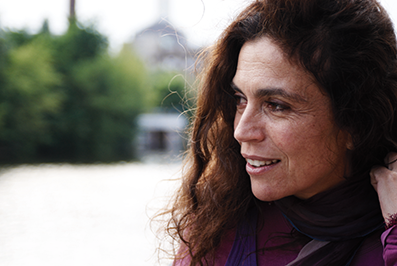 In the mid-1990s, she joined forces with jazz / traditional musicians forming a band known as ‘Primavera en Salonico’, interpreting Sephardic and Mediterranean songs, having recorded 8 CDs in Lyra and ECM records and giving concerts all over the world. She has been a founding member of an Early Music ensemble in Athens (“Early Music Workshop”) in the ’80s and has always displayed a keen interest in exploring free jazz music. She has collaborated with Peter Kowald, Floros Floridis, Barry Guy, Nikos Touliatos, Gunther Pitscheider, Gerald Preinfalk, Gunther Baby Sommer, the Ensemble “Medea Electronique”, and the Ensemble Constantinople. Yannatou is also a songwriter (CDs “Dreams of the mermaid: Is king Alexander alive?”, “Rosa das Rosas”, “Musique Des Chambres” Lyra records). She has composed music for theater (National Theater of Greece, National Theater of Northern Greece, Thessalian Theater, Theater of Neos Kosmos, “Playback” theater, for the plays: “Medea”, “Bacchae”, “Ifigenia in Aulis”, “Dibuk”, ?The Caukasian Chalk Circle”, “Persona”, “The Suppliants”) and for pantomime performances.